And it definitely gives you an idea of how “important” this issue is. It will shape Captain America for almost the rest of the decade. 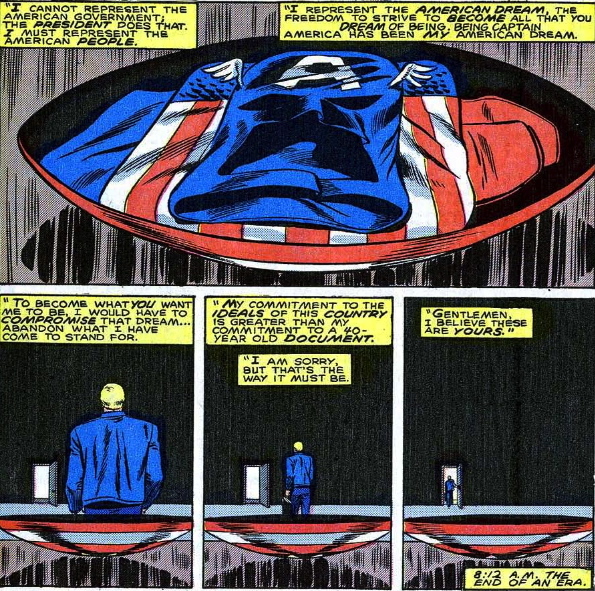 A few issues ago, an IRS agent stumbled upon the fact that Cap is really Steve Rogers, and in this issue the heads of the CIA and FBI haul him in for a hearing and tell him that his costume and identity are government property. Which is kind of true. As an aside, this means that SHIELD has information that CIA/FBI do not have. It seems to put SHIELD higher on the food chain—because they’ve known Cap’s identity for years. Anyway, these guys now want Cap to work for them. He’s kind of in the wrong here. He’s a soldier, he’s using a weapon (his shield) that he got during service and an identity that reflects his role as a servant of the U.S.A.